Welcome to Lewis Tree Service, an established full-service tree care company serving the counties of Monterey and Santa Cruz! We have more than 20 years of experience in arboriculture and use only trained and certified staff to address virtually any type of issue related to trees, plants, yards, and landscapes. Stump grinding is a highly specialized service that should only be done by an well-trained technician. Because of the technical knowledge and equipment involved, it can be a risky and dangerous to attempt as a do-it-yourself project. Typically, stump grinding is called for when a tree stump cannot be removed (often, because of the potential for damage caused by the roots). For more information about stump grinding and why it’s a necessary component of the overall health of a landscape, see this article from the National Arborists. When left unaddressed, a tree stump can become a nuisance to surrounding plants, especially when it comes to the spread of fungi and disease, which can seep into the soil and infect surrounding plants and trees. 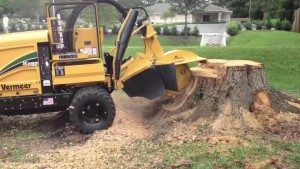 A very important factor to keep in mind when hiring a professional to grind or remove a tree stump is if there are any obstacles that may cause a problem. This includes anything, especially underground, that may be affected by the reduction of a stump and its roots. The main issues that come up in this regard are sprinkler systems, underground electrical wiring, sewage lines, and utility assets that may be below the lawn surface. Call us today at (831) 508-8995 if you have questions or need a stump ground down in Santa Cruz or Monterey! We have certified arborists ready to answer your questions and we provide a FREE cost estimate–contact us today to learn more!